SecureDry evidence drying cabinets are designed to provide a secure and dedicated area for drying wet evidentiary items while creating a barrier to keep out the potential threat of cross contamination. The cabinet utilizes pre-filtration, HEPA and carbon filtration to minimize the potential for environmental cross contamination and employee exposure to putrid odors or biological material. SecureDry is constructed from rigid white polypropylene that is thermally fused in order to create a continuous chamber, eliminating structural cracks and crevices. The elimination of cracks and crevices allows for ease of cleaning and maintenance between cases and minimizes the potential for bio-burden build-up. An optional timed 254 nanometer UV light is available for chamber irradiation, further reducing cross-contamination risk. Added security comes from the powder coated steel doors with keyed entry, not found on other drying cabinets. This reinforced steel door is designed to provide a tamper resistant barrier while creating a positive seal between the chamber and the environment, minimizing the potential for cross contamination. By drying crime scene evidence with SecureDry™ you keep your occupational exposure to potentially harmful biological material to a minimum. • Technostat pre-exhaust filter, located on the front of the cabinet below the clear acrylic door, traps particles down to 5 microns, and, therefore, prolongs the working life of the two remaining filters described below. (double door version has two separate Technostat pre-exhaust filters) . • 3" Thick, aluminum framed HEPA secondary exhaust filter traps particles down to 0.3 microns in size (double door version has two separate HEPA secondary exhaust filters). • 4" Thick carbon, mixed bed, final-filter eliminates odors and gases (double door version has two separate carbon, mixed bed, final-filters). • Filtering system effective to 99.997%. • Unlike most evidence drying cabinets, the air is drawn down from the top front of the cabinet and exhausted through the bottom. Since room air is usually cleaner near the ceiling, this unique approach prolongs the working life of the air intake pre-filter. • Complies with OSHA guidelines. • The Technostat air intake pre-filter(s) on the top front of the cabinet should be replaced every 3 to 6 months under normal use or when it becomes discolored. 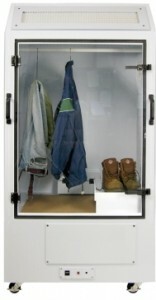 • The Technostat exhaust pre-filter(s) located in the bottom (below clear acrylic door[s]) of the cabinet should be inspected every 6 months and changed if discolored. • The HEPA and carbon mixed bed filter(s) located in the bottom (below clear acrylic door[s]) of the cabinet have a working life from 24 to 36 months under normal use. • Filters are easily changeable by operator. • Drying cabinets are supplied with a complete set of filters. • Red Warning light indicates filter(s) needs to be replaced. • The cabinets are made of a heavy gauge white polypropylene throughout, this facilitates easy cleaning with detergent and a 10% bleach solution. • Single Door Drying Cabinet Interior dimensions are 35" Wide X 27" Deep X 53" High, (28.44 cubic feet). • Single Door Drying Cabinet Exterior dimensions are 36" Wide X 28" Deep X 73" High. • Double Door Drying Cabinet Interior dimensions are 59" Wide X 26.5" Deep X 53" High, (47.73 cubic feet). • Double Door Drying Cabinet Exterior dimensions are 60" Wide X 28" Deep X 73" High. • Four 3" heavy-duty lockable casters allow cabinets to be easily moved from one location to another or stored when not in use (fits through any door). • Single Door Drying Cabinet Weighs 250 lbs. • Double Door Drying Cabinet Weighs 380 lbs. • Gravity drain located 20" above the floor for proper drainage into a floor drain via a 1.25" ID drainage hose or into the waste water container supplied. • Clear acrylic door(s), 3/8" Thick X 31 1/8" Wide X 43" High with two key locking handles to insure evidence security during the drying process (two sets of keys supplied). • Supplied with a polypropylene free standing tray for shoes or other small evidence requiring drying. • Single Door Drying Cabinet is supplied with one low noise, 200 cfm centrifugal fan, yields more than 150 cabinet air exchanges per hour. • Double Door Drying Cabinet is supplied with two low noise, 200 cfm centrifugal fans. • 1 Year warranty on parts and labor.